My "Simply Moving" posting earlier today would not allow me to put up another photo. Here is a PS, with a photo of the Segway just like the one that the young man who spoke at the conference got his motor-scooter license to drive. What a lot of successful young people there are in the conductive world. Still we hear 'Conductive Education is about getting people to walk'! I could have added facilitated parachute jump, but that was not one of yours. Apologies. The Sedgeway lad was not one of yours either. So that makes just six for you! But the score for CE as a whole still stands on this count at nine different means of satisfactory and satisfying locomotion. I am sure others might help this score up into double figures out of their own experience. And by the way, I had also meant to mention that what 'Laddo' is doing here should not be confused with so-called hippotherapy. It is an orthofunctional lifestyle activity achieved. The girl who passed her driving test, who now drives herself to University every Monday morning, was the first client who I taught to swim. We used the pool in her garden and it was freezing but we still jumped in every day for three weeks. We could bear it for at the most 20 minutes but she did it. She achieved her summer holiday goal of learning to swim! The same client also started her skiing lessons with me in the back garden but went on as a teenager to have some professional lessons in Switzerland. There she worked with a trainer who specialises in teaching people with disabilities to ski. Little Princess also had her first swimming lessons with me this summer. She fully conquered her fears of the water and managed two or three strokes unaided. Jolly Prof. has also learnt to move around on slipery surfaces, he goes ice skaiting, but not with me. Since I broke my wrist badly while ice skating ten years ago I now steer clear of it. Jolly Prof's school assistant has taught him to skate with me advising once or twice from the sidelines! He began with a chair on skis that he pushed along in front of him! Yes as you say, Laddo who is featured over on my other blog, does not do so-called hippotherapy. He simply goes riding and has done so once a week for most of his life. For a while he had his own pony who lived in the paddock with his Grandfather's cattle. As you say it is an orthofunctional lifestyle activity achieved. Laddo also does not do art therapy with me. He is an artist who exhibits his work regularly. He simply likes to paint and fortunately some people like his paintings enough to buy them. 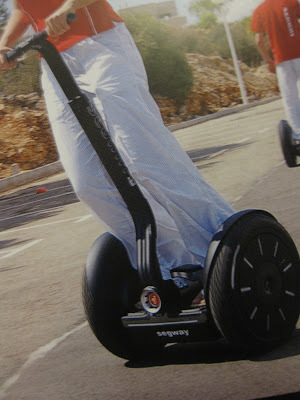 The Segway was tried by one of my MS clients but it was then too expensive for him to purchase. At the weekend in Würzburg I saw a wonderful short film of a man from Switzerland who had suffered a stroke. He attended the Petö Institute for as long as it took for him to drive away on his motorbike. I would have liked to have written "on his Harley Davidson", but I am not sure that it was. I expect there are more means of personal locomotion but I cannot think of them from memory either.